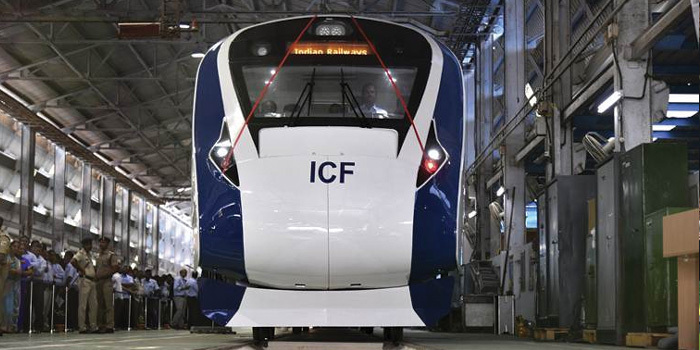 (New Delhi, Jan25, 2019): Railways'' ambitious Train 18 has got "provisional" clearance from the Electrical Inspector to the Government (EIG), but it has laid down nine conditions for it to be made commercially operational, sources in the know told PTI. The train, which sections of the railway ministry said could be flagged off in a week''s time by Prime Minister Narendra Modi, has got the EIG clearance only for three months. The inspection was done over three days after the train was given a safety clearance with certain conditions by the Chief Commissioner Railway Safety around a month back. One of the CCRS conditions was EIG clearance. The EIG clearance, sources said, is "provisional" and expires in three months. The EIG clearance has stipulated conditions which include that Train 18 has to be maintained in an electrical shed with an electrical officer as head. One of the conditions also is to separate HT termination and LT Power cabeling — (high tension and low tension cables of the Train-18 needs separation). The train was sent for EIG inspection on Monday after the Railway Board gave its approval despite objections from its rolling stock department, which designed and manufactured the state-of-the-art train. The rolling stock department had argued that there was no legal or administrative precedent to send the train for EIG inspection, as it already had received certification from Research Design and Standards Organisation. The source said the report of the inspection will be sent to the board after which a decision will be taken on when to officially launch the train. The 16-coach train, built in 18 months at a cost of Rs 97 crore, is regarded as a successor to the 30-year-old Shatabdi Express. It''s also the first locomotive-less train in the country.